For the first decade we were a single-issue campaign group – shouting loud about the problem of polluted waters, how it was making people sick and pointing towards the sweeping new environmental legislation coming out of Brussels at the time that the UK government and water companies needed to pay more attention to and as quickly as possible we argued! The tide had started to turn on the need to drastically improve UK bathing water quality with the privatisation of English water companies in 1989. 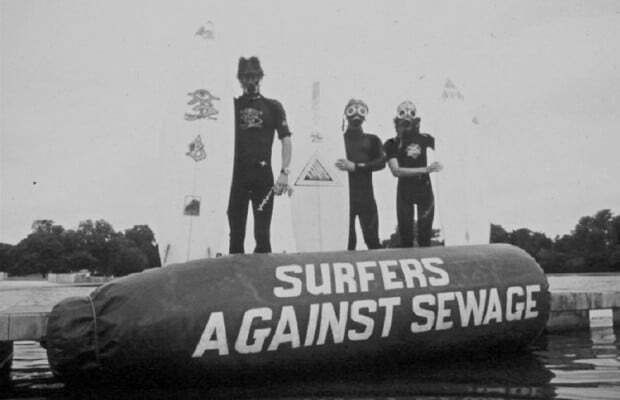 This change, coupled with two key pieces of European legislation, gave us a framework for the first decade of Surfers Against Sewage campaigning. The EU Bathing Water Directive and the Urban Waste Water Treatment Directive 1991 were the real game-changers that provided a perfect legislative backdrop to us drive forward the call for cleaner oceans. We swiftly became high profile eco-activists, clad in wetsuits and gasmasks, carrying surfboards into boardrooms and political meetings that still barely knew you could surf at all in the UK, let alone believe you could get sick whilst doing it. We became a catalyst for change, highlighting the need for faster sewerage infrastructure investment, collating health evidence from ‘contaminated’ water users and connecting previously disparate surfing communities into what became one of the best-recognised environmental campaign movements of the 1990s. As a result of our work, the UK has seen massive investment in the sewerage infrastructure and much higher bathing water standards protecting us all at hundreds of locations nationwide when we do the sports and recreation we love. Today 96.9% of our beaches meet the minimum bathing water standards. In 1990 this would have been just 27%! We’re very proud to have played our part in bringing this positive change about for our coastlines. Whilst water quality issues still run strongly in our organisational DNA, we’ve now grown to take on emerging issues, represent the voice of even more people like you and become advocates of clean oceans on the world stage. We’ve also gained charity status to ensure transparency, good governance and facilitate fundraising so we can achieve even more to protect our coastlines together. Our community has grown from tens of thousands of supporters in the 1990s to hundreds of thousands of supporters today, with a reach of millions to win hearts and minds globally. We also talked to our members and supporters about the emerging issues, taking on new projects that were threatening our coastlines just like sewage pollution did back in 1990. Marine plastic pollution and climate change stood out most of all. These more complex global issues are what we are focused on today, and our priority vision is for Plastic Free Coastlines. With more plastic having been produced between 2002 and 2012 than in the whole of human history before that, and this trend only growing, it’s no surprise we have a plastic pollution crisis in our oceans. This is our new sewage. What has always remained though is our unique identity, shaped by the same forces from which we were borne. Our shared love for and contact with the ocean. We are part of the ocean.